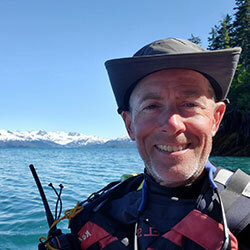 John Chase is an NASM Certified Personal Trainer, ACA L3 Coastal Kayak instructor, L2 River Kayak Instructor, L2 SUP Instructor, and author of "Power to the Paddle: Exercises to Improve your Canoe and Kayak Paddling". John helps people improve their personal fitness and make the most of their lives, on and off the water. When not on the water, John enjoys mountain and road biking, adventure racing, rock climbing, and alpine mountaineering. Learn the principles that experienced leaders follow to safely support groups for day trips on the water. John will focus on pre-trip planning, group and expectation management, risk assessment, and incident management. If you're looking for 45 minutes of war stories about how Cousin Eddie got pinned on that nasty rock, this isn't the place. John focuses on practical stuff you can use to lead your first, fifth, or 100th trip. Loading your personal and shared group gear in your boat is part art and part science. This hands-on workshop will equip you with tips and tricks to pack your kit for a dry, safe, and enjoyable multi-day journey without having to cut the handle off your toothbrush. Join this fun, hands-on session where you'll learn and practice functional exercises to help you paddle longer, faster, and stronger. Learn simple exercises requiring little or no equipment that target crucial muscles to be a better paddler, build endurance, and prevent injury. You'll improve your outdoor experience and become the best paddler you can be!